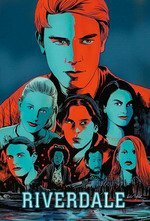 The Black Hood challenges the residents of Riverdale to remain sinless for 48 hours; Penny Peabody calls in a favor Jughead owes her, putting strain on his relationship with Archie; Betty and Veronica investigate a suspect. Ever since Riverdale‘s second season decided to lean much more heavily on the thriller “whodunnit” aspect of the series, I’ve been waiting for an episode like tonight’s. I felt the stakes in this hour. I believed the drama. And I loved it as much as I loved Sheriff Keller’s abs (which is to say A LOT). Sabrina the Teenage Witch should be showing up any second now. That's my biggest takeaway from tonight's episode, the first in the series to date to not feature narration from Jughead. There's been a ramping up of supernatural elements this season, but it wouldn't be too hyperbolic to call tonight's non-traditional installment a game changer. And a ton of pop culture references cited by Cummins, in addition to the usual Archie lore (Mr. Svenson the janitor is a long-time supporting character in the comics, but not so creepy and sin-obsessed). Last but not least, Tunefind's citation of which songs were played where in the episode. I've been sort of down on this whole season compared to the first one. I wanted more nutty gothic antics, more Blossom board meetings to determine the course of the maple syrup empire, more wondering whether Betty's sister was a hallucination or an alt, that kind of thing. This season felt flatter and less fun overall until last night, when it got weird and unpredictable again. I don't want to know what's going to happen. I want them to surprise me! I want to gasp and cheer and snicker. This episode moved back in the direction I want the show to go. Cthulu in Riverdale is exactly what I want. The stupidity of Jughead (have you no google? Call the prison, you moron! I shouted with great enjoyment) was done with exactly the right teenage idiocy, throw in more Elder Gods and I'm theirs. Yes! This episode was great. THIS is the Riverdale I want! Title cards and faux found-footage! Parallel story lines! Mysteries! Ghost deer! When I saw Sheriff Keller pull up to a fleabag motel, I was literally shouting at Betty, "He's not the Black Hood, dummy! He's probably boning... I don't know, who's lonely in Riverdale? Like the MAYOR or something." Then came the reveal. womp womp. Also, TONY TODD, one of Star Trek's greatest guest stars, was the creepy trucker! TONY FRIGGIN TODD. TONY. TODD. Cheryl Blossom is possibly my favorite TV villain of all time. A taxonomy of Riverdale's Hot Dads. I knew I was old when I found the parents hotter than the kids. Sad there was no Alice Cooper in this episode though. 1. Tony Todd! Yes, tell me an urban legend, Tony Todd. 3. So... Mr Svenson is the Black Hood, right? At least the show seems to want us to think that. Note: Chris Cummins is incorrect, I believe: there was no Jughead Narration in "When a Stranger Calls," because Jughead was kept apart from knowing what was going on on the Northside via Betty's and Archie's estrangement from him. And because all of the real information belonged to Betty. But yeah, Noir, Horror and Pulp Fiction made this a hell of a needle to thread but the show pulled it off. I want to know more about who is stealing Cthulhu artifacts and why! Nothing else can possibly be as interesting! Also can the Black Hood dreamwalk?